codebytes: Finding the in-order successor of a given Node of a Binary Tree. Finding the in-order successor of a given Node of a Binary Tree. Q. Write an algorithm to find the 'next' node (i.e., in-order successor) of a given node in a binary search tree. You may assume that each node has a link to its parent. 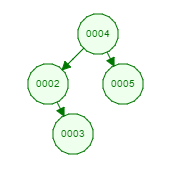 Case 1: Node is root or is the last Node in in-order traversal. (return null). 1. Check if there is a right node. If there is a right node, go to it's farthest left and return that node. If there was no left node in the first place, return that right node. 2. If there is no right node, go back up. Now if the previous node was a left child, print parent else keep going up. 3. If you reach null, there is no left child in the path (in Case 1) print null.